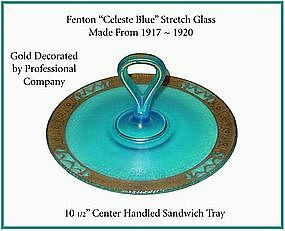 This Celeste Blue center handled sandwich server was made by The Fenton Art Glass Co in the 1920's. It has gold decoration with a pattern in the gold band and lined with gold trim also. Theree are a couple of tiny skips in the gold trim lines but nothing terrible.